Come and play with toy cars like you never have before! 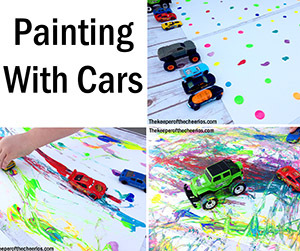 We’ll have painting with car wheels, build your own race course and enjoy a WHEELY fun sensory bin. Please feel free to drive on in anytime between 10:30 am and 1:00 pm. Whether you’re currently crazy about cars or you’re automobile enthusiasm has yet to take off, join us for this fun event.